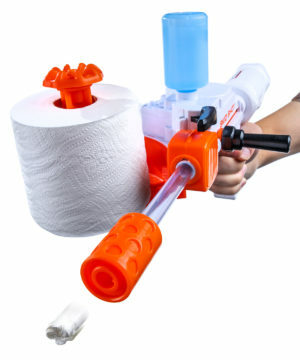 Skid Shot TP Blaster: Spitball shooter with toilet paper ammo. 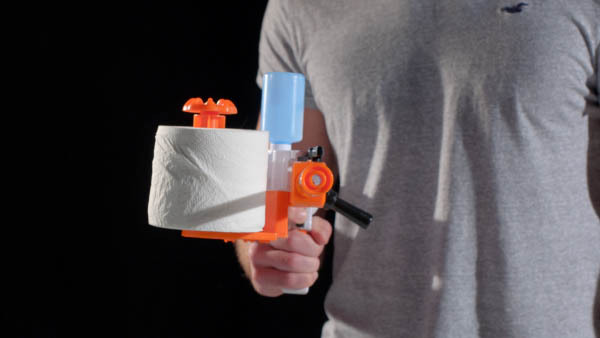 Turn a classroom slacking activity into an all-out toilet paper assault and arm yourself with the Skid Shot. This irreverent rifle shoots slimy wads of toilet paper up to 30 feet! Load a roll of two-ply onto the faucet-inspired spool, fill the reservoir with spit-free water to moisten your missile, crank the loader to feed a sheet into the chamber, slide the action to pressurize the paper, and pull the trigger to let fly your perfect spitball! Less gross than using saliva and more fun than blowing through a straw, the Skid Shot takes spitballing to a new level. Taking slacking seriously means arming yourself with the Skid Shot 30 TP Blaster, a harmless piece of hardware that fires wet, sticky missiles made out of toilet paper. Using nothing more than mechanical power and tap water, a few cranks and a pull of the trigger fires sanitary wads of bathroom tissue up to 30 feet! Each action with the rifle automatically loads in more TP for your next shot so you can wipe out the competition with ease! Question: What kind of toilet paper will it work with? Answer: You'll probably find that tougher toilet tissue with more plies will stand up better, but the Skid Shot is designed to be compatible with just about any roll of standard-size toilet paper. Question: Does it come with toilet paper? Answer: You will need to provide your own TP and water to make the Skid Shot work.